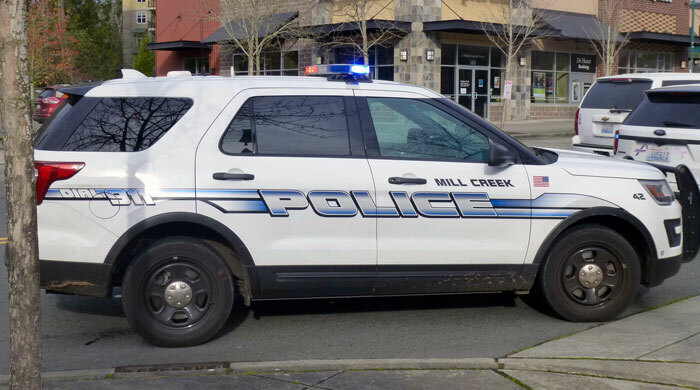 According to the latest Mill Creek Police Blotter, a total of 454 responses were reported the week of June 8th to June 14th, 2018. 01:39:03 - 16200 BLK MILL CREEK BLVD: Police made contact with a 29 year old male in the 16200 block of Mill Creek Blvd. Subsequently, the male subject was found to have a misdemeanor warrant and was booked into Snohomish County Jail. 15:03:39 - 2600 BLK 132ND ST SE: Officers responded to a counter complaint regarding a felony level theft. A 48 year old Mill Creek woman reported that jewelry valued in excess of $10,000 had been stolen from her home. The woman suspected a male acquaintance had committed the crime. Through investigation officers developed probable cause to arrest the male (a 38 year old Lk. Stevens man). 20:07:43 - 17900 BLK BOTHELL EVERETT HWY: An officer made a warrant arrest in the 17900 block of Bothell Everett Hwy. A 30 year old male from Everett was arrested on an outstanding warrant. The suspect’s vehicle was impounded and a search warrant was completed. The male was arrested for possession of a controlled substance with intent to deliver (meth/heroin), and booked into the Snohomish County Jail. 22:27:11 - 14700 BLK MAIN ST: Officers responded to a domestic disturbance in the 14700 block of Main St. A male and female were arguing loudly, however, investigation determined there was no assault and no crime occurred. 14:07:47 - 13500 BLK NORTH CREEK DR: Officers spotted a vehicle reported stolen out of Auburn in the 13500 block of North Creek Drive. Officers caught up to and stopped the vehicle in the 200 block of 128th ST SE. Four occupants were temporarily detained as the ownership of the vehicle was sorted out. 16:50:21 - 14800 BLK 35TH DR SE: Officers responded to a report of a missing person in the 14800 block of 35 Dr. SE. 23:19:13 - 14700 BLK MAIN ST: Officers responded to a disorderly conduct complaint in the 14600 block of Main Street. 14:08:30 - 3000 BLK 162ND PL SE: A Mill Creek officer responded to a report of items stolen from a home during a time a contractor was on scene. 16:49:54 - 3300 BLK 132ND ST SE: Officers were dispatched to a minor parking lot collision in which the situation escalated to an assault. 14:03:31 - 15100 BLK MAIN ST: A woman reported that her vehicle had been struck by another while parked in the 15100 block of Main Street. The incident was witnessed by another party who advised the victim and provided a suspect vehicle license. Further investigation is pending. 15:46:37 - 14900 BLK BOTHELL EVERETT HWY: A Mill Creek officer responded to a theft report in the 14900 blk of Bothell-Everett Hwy. A female was reporting several items stolen. 19:31:10 - 14700 BLK MAIN ST: Police responded to physical domestic disturbance between a father and his son in the 14700 block of Main Street. Subsequent to investigation, no crime had been committed, but a report was taken of the incident. 13:42:00 - 4200 BLK 132ND ST SE: A business complex in the 4200 block of 132nd ST SE reported three windows in their building were struck with BBs sometime overnight. 01:56:32 - 3400 BLK 132ND ST SE: Officer responded to a robbery in the 3400 block of 132nd St SE. Three suspects robbed a store with weapons and fled. 20:47:31 - 13300 BLK BOTHELL EVERETT HWY: Officer responded to a disturbance in the 13300 block of Bothell Everett Hwy. A 23 year old male from Idaho was arrested on an outstanding felony warrant and booked into the Snohomish County Jail for being a Fugitive from Justice. Click on this link to see the June 8th to June 14th, 2018, Mill Creek Police Blotter.